It's Official - Kenta Maeda is a Dodger! Nevermind that Cooperstown press conference, today is your day Kenta! Maeda is a two-time winner of the Sawamura Award (the NPB equivalent of the Cy Young); including winning it last season with the Hiroshima Toyo Carp. Last year he led the Japanese Central League by going 15-8 with a 2.09 ERA in 29 starts. Maeda struck out 175, walked 41, gave up only five home runs, posted a 1.01 WHIP, batters hit .222 average and right-0handers hit just .160. "I am very honored to be a Dodger," Maeda said in English after putting on his uniform and cap. "During my physical there were some irregularities that surfaced that was factored into the contract that I signed," Maeda said. "Despite the fact that there were some irregularities found in the physical, the Dodgers made the decision to make a long-term commitment to me and that was meaningful to me, so I decided to make a long-term commitment to the organization." In truth, this entire post is just an excuse to share more fantasy Baseball cards I made this afternoon of Maeda. Check them out above and below. I used photos tweeted out by the Dodgers and originally taken by Dodger photographer Jon SooHoo (here, here, here and here). 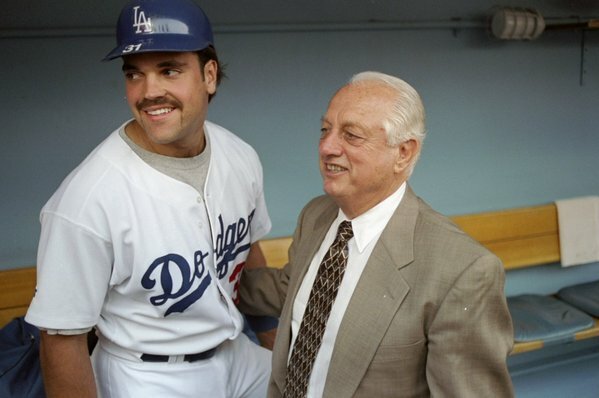 Here's a great photo of freshman Hall of Famer Mike Piazza with grizzled old-pro Tommy Lasorda, via Tommy's twitter. Those were the day's, eh? This burgeoning young star was on the cusp of what would be an incredible career. He would wow crowds with breathtaking home runs while becoming the most prolific hitting catcher of all time. Unfortunately, his time in LA isn't one of fondness for him. Instead, there's been plenty of controversy; much of which was written about yesterday by Steve Dilbeck at the LA Times: "Mike Piazza has made it hard for Dodgers fans to share his happiness." Piazza comes off a bitter man. It’s distasteful and sad, and sours the six years he spent here establishing himself as one of baseball’s premier hitters. He is the godson of Tommy Lasorda. The Dodgers took him in the 62nd round of the draft and brought him up through their system. He was the National League Rookie of the Year here. Fans adored him. Yet he acts like his time with the Dodgers was pure hell. That the organization and fans, even Vin Scully, all turned on him. There is a 1:00 PM press conference at Dodger Stadium today. 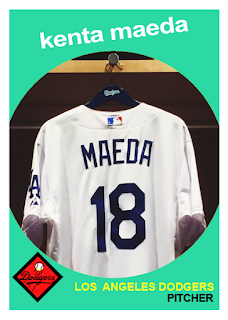 The announcement didn't state what it would be about, but I think it's fair to say that they'll be officially announcing the Kenta Maeda signing. The last portion of the press release was in Japanese. Beachy, 29, has gone 14-12 with a 3.36 ERA in 48 Major League starts in five seasons with Atlanta (2010-13) and Los Angeles (2015), missing significant action due to Tommy John surgeries on June 21, 2012 and March 21, 2014. In 275.2 innings in the big leagues, Beachy has limited opposing hitters to a .223 batting average with a 1.16 WHIP and posted a 3.04 strikeout-to-walk ratio, striking out 280 and walking only 92. Eric Stephen at True Blue LA shares details of Beachy's contract here. It is heavily incentive laden. Via Bill Plunkett at Baseball America, "Montas Waiting In The Wings For Dodgers." The 6-foot-2 Montas is one of the hardest-throwing pitching prospects in baseball with a fastball that reaches 100 mph and a power slider. He made his major league debut with two starts for the White Sox in September and is considered major league-ready if the Dodgers want to move him to the bullpen. David Hood at True Blue LA shares his prospect report on recently acquired outfielder Trayce Thompson, here.